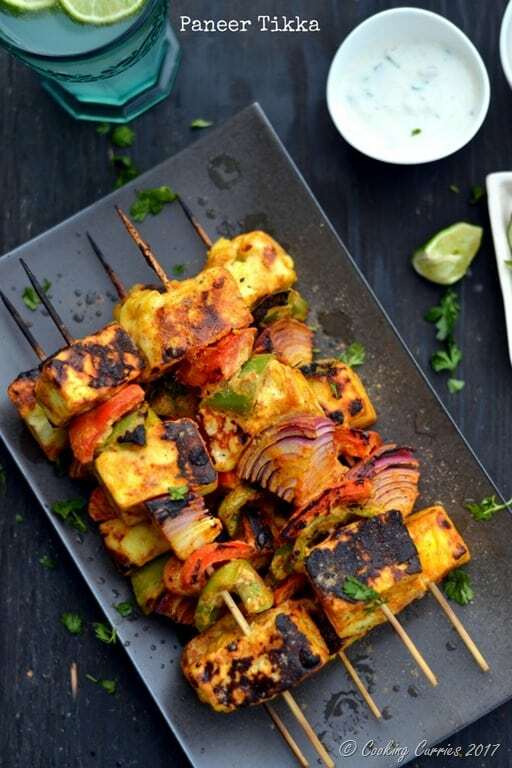 Paneer Tikka, a marinated and grilled Indian cheese and vegetable skewer, is a delicious, easy, and flavorful grilled Indian dish everyone loves! This post originally appeared on SweetCsDesigns.com, where I guest blogged. Just like how spring blossoms are synonymous to spring, barbeque / grilling and outdoor eating is synonymous to summer, for me. We have a little deck that goes out from the breakfast nook and that is the single most over used space in summer. We have our grill there and we grill something or the other most days and eat outside on those days. Other days, we just take our food outside and sit there and eat, till it gets too dark to see anything or till one of us has to get up to go get the kiddo ready for bed. 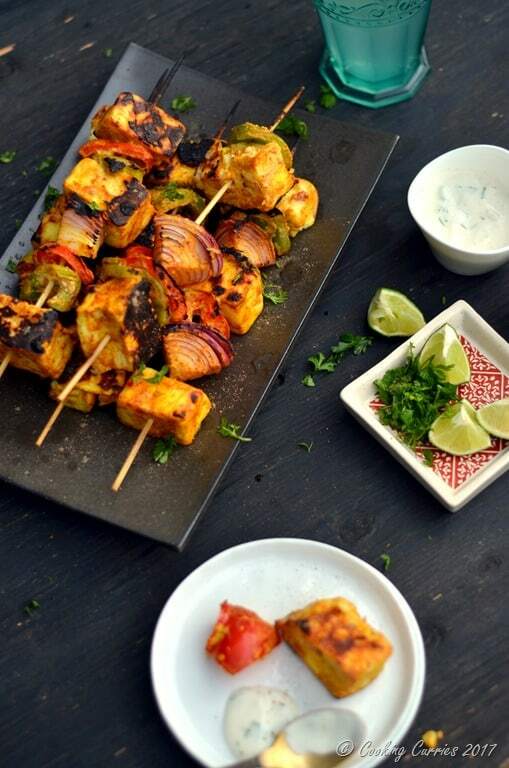 Paneer Tikka is a tandoori dish, which means, it is traditionally grilled in the clay tandoor over. Growing up in India, the only time we ate this was when we went out to restaurants. Grilling or barbeque–ing at home was not really the culture. I did not know anyone that owned a grill! So, when I moved here to Seattle several years ago and was invited to a friend’s house for a barbeque, I was excited. I did not know what to expect. Being a vegetarian, I could not think of many things one could make in a grill and I really hoped that I did not come back hungry. I had these paneer tikkas there for the first time, the kind grilled, but not in a tandoor. It was delicious and I could not believe that this could be made at home. From then on, this simple yet flavorful and filling dish has been a favorite and our go-to for an Indian style barbeque and they are also great to take with us on camping trips. We would marinate the paneer and the veggies and put them in a Ziploc and freeze them. That way, they remain cold enough and slowly defrost by the time we get to the campsite, set up and are ready to start with dinner. This is such a versatile recipe and you can easily substitute the paneer with chicken to make it more omnivore friendly. Mix all the ingredients for the marinade together in a large bowl. Toss the paneer cubes, onions and peppers and mix to coat well. Chill for at least 20 mins in the refrigerator. Preheat the grill. 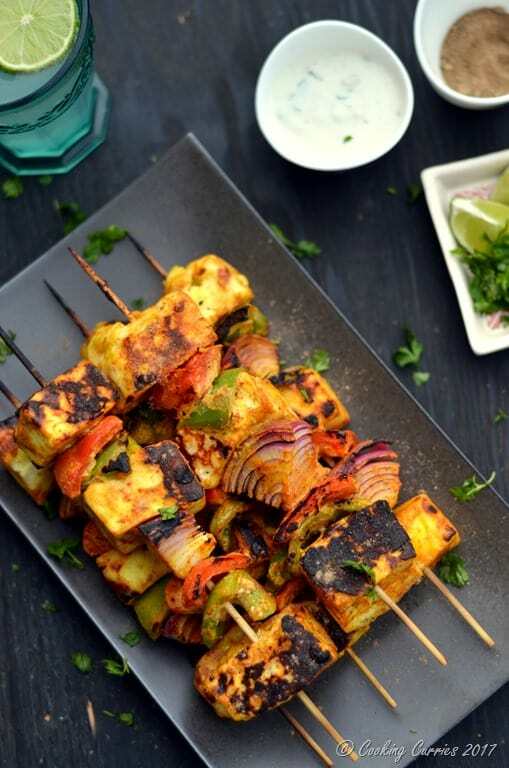 Skewer the paneer and the veggies alternatingly. Spray a non-stick grill pan with cooking spray and place the skewers on it. Turn them around every 5-10 mins or so and they will be done once you don't see any raw marinade on them. Sprinkle some minced cilantro and chat masala and squeeze a lime wedge just before serving. 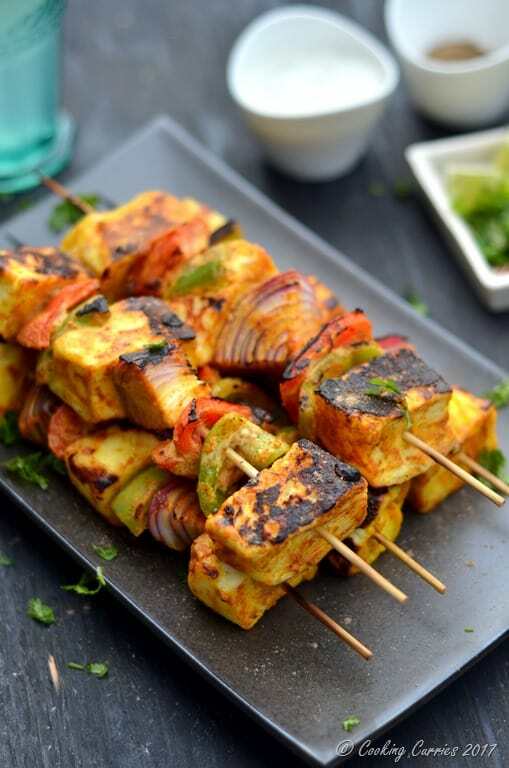 The cooking spray is so that the paneer and veggies dont stick to the pan or the grill as they dont have any inherent fat in them to help with not sticking. Yum! Such an exquisite recipe! Can’t wait to give it a try! Everything looks yum. Will have to try out. Thank you! Do let me know if you try it ?